I wanted to make something for Back to School, which is coming way too soon for my liking, which was cute and practical and I thought these Crochet apples made into hand-warmers would come in “handy” for those chilly Autumn mornings. 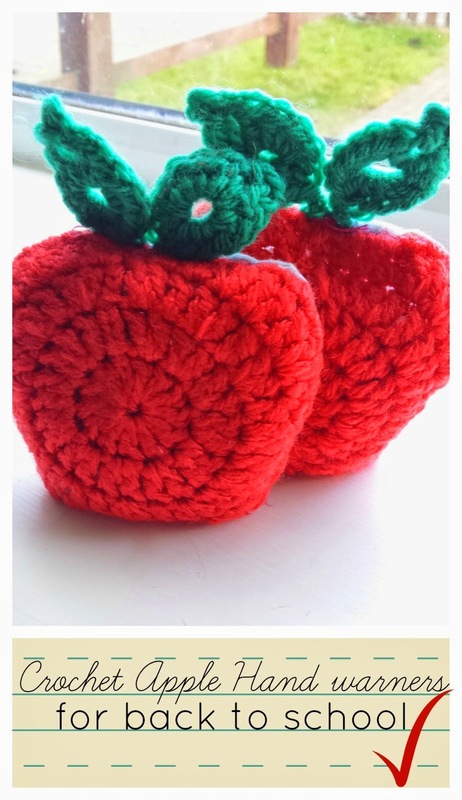 You will need 2 crochet apples. ch1, Dc in next, 2 htbl in next, 2 tbl in each of the next 2 st. 1 tbl in next, 2 tbl in next, 1 htbl in next, dc in next. Sl st in each of the next 5 st.2 htbl in next, 2tb in next, 2 dc in next, sl st between next 2 st. ( centre bottom), sl st next 2 st, 2 dc in next, 2 tbl in next st, 2 htb in the next st, slst in next 5 sts, dc in next st, 1 htbl in next, 2 tbl in next , 1 tbl in next , 2 tbl in next 2 st, 2 htbl in next st, 2 dc to end. Stitch leaves to apple and weave in ends. To make into hand-warmers – Place onto the backing material and trace around cut outside the line. 2. 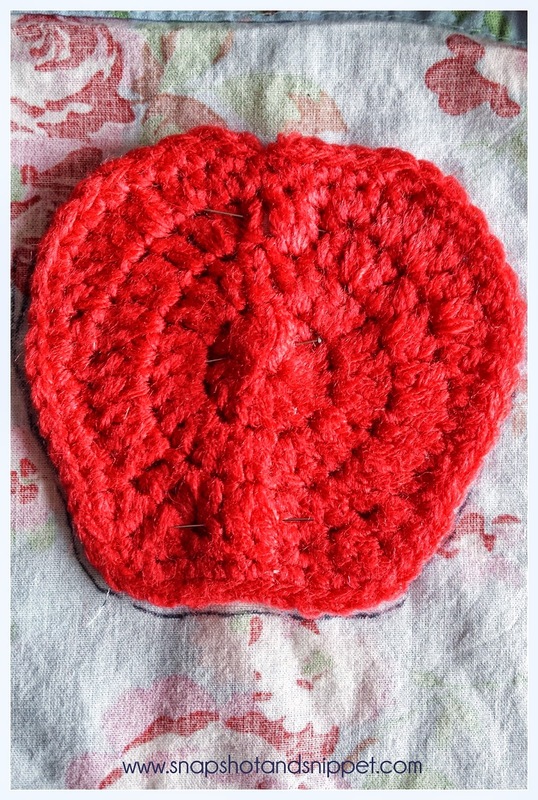 Pin the backing material to the apple with the back of the material and the crochet facing out and the leaves sandwiched inside. 3. Sew together with matching thread leaving a small gap at the bottom to turn the apple the right way out and fill. 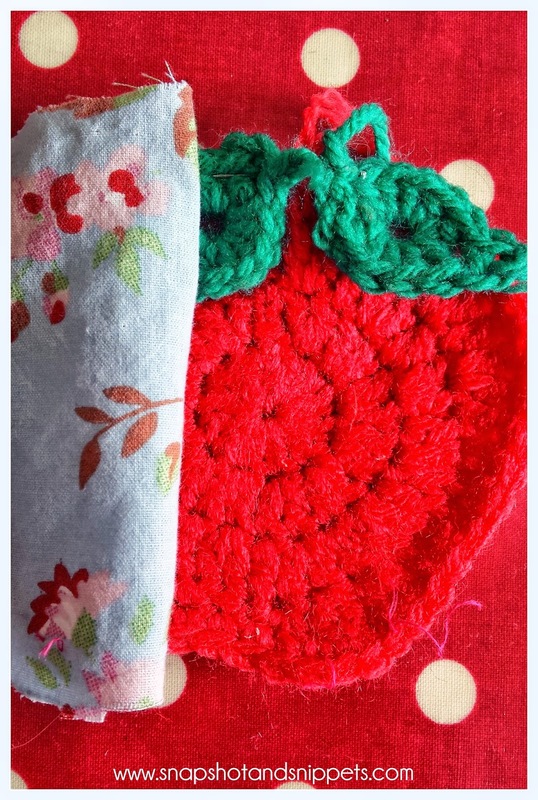 If you find that your crochet stitches are too loose to hold rice, you will have to line the back of the apple I crochet kind of tight so mine were fine. 4. Fill with Rice scented with essential oils of your choice and sew closed. These can be heated for 20 seconds in the microwave to warm them through and placed in jacket pockets to keep hands warm. If you liked this Crochet project check out my other projects below. You can also find more posts by heading to my Start here page. Or sign up for my Snapshot and Snippets Newsletter and get your Free Beginners guide to Crochet.